Health experts urge us to eat more fish because of its beneficial health effects, but toxins in contaminated fish can cause health problems. Two common causes of fish-related food poisoning are ciguatera and scombroid, and travelers may be at risk of these illnesses. Ciguatera (sig-wah-TARE-ah) is caused by eating fish contaminated with toxins that are produced by microorganisms that live around coral reefs. Small fish eat the microorganisms, and large fish eat the small fish, which concentrates the toxins. The highest concentrations of toxins are found in the liver, intestines, eggs, and head. Because fish can be shipped around the world, ciguatera can occur anywhere, including in the United States. 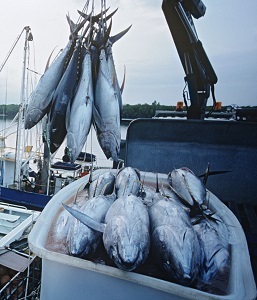 However, the risk is highest in fish from the Caribbean Sea and the Pacific and Indian Oceans. As many as 3% of travelers to these areas get ciguatera. 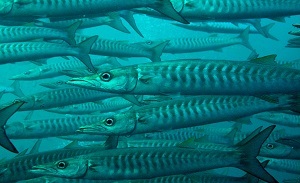 Ciguatera is most commonly caused by eating barracuda, grouper, moray eel, amberjack, sea bass, sturgeon, parrot fish, surgeonfish, and red snapper. 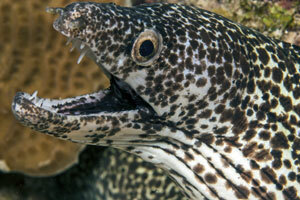 Ciguatera symptoms usually develop 1–3 hours after eating contaminated fish. They can include nausea, vomiting, diarrhea, and stomach pain. Some people may have neurologic symptoms, such as a tingling sensation, tooth pain or feeling as if the teeth are loose, itching, a metallic taste in the mouth, and blurred vision. There is no treatment for ciguatera, so travelers should avoid eating the fish listed above, particularly barracuda and moray eel, and avoid eating the organs in which the concentration of toxins is highest. The toxins that cause ciguatera do not affect the appearance, taste, or smell of fish, so there is no way to tell if fish is contaminated. The toxins are not destroyed by heat, so even thoroughly cooked fish is a risk. Scombroid (SKOM-broyd) is caused by eating fish that has not been properly refrigerated or preserved and therefore contains high levels of histamine. Scombroid is most commonly caused by fish that have naturally high levels of the amino acid histidine, which bacteria convert to histamine when the fish is not correctly stored. Scombroid occurs worldwide. Fish typically associated with it include tuna, mackerel, mahimahi, sardines, anchovies, herring, bluefish, amberjack, and marlin. Scombroid symptoms usually develop within a few minutes to an hour after eating contaminated fish. They usually resemble an allergic reaction, such as flushing of the face, headache, heart palpitations, itching, blurred vision, cramps, and diarrhea. Symptoms can be treated with antihistamines. Even without treatment, people usually get better within 12 hours. Contaminated fish may taste peppery, sharp, metallic, or bitter, but it may also look and taste normal. Fish should be iced, refrigerated, or frozen immediately after it is caught. Histamine is not destroyed by heat, so even thoroughly cooked fish is a risk.